Women love a bargain especially when it comes to clothes. Our buyers have carefully selected women’s clothing and accessories to feature in our discount wholesale women’s clothing category. These items pass our merchandise quality requirements and we are making them available to you wholesale at $5 or under per unit. Famous Brand ladies sleeveless crew top. Famous Brand ladies tank top. Famous Mall Store ladies lace up bell sleeve blouse. Famous Brand ladies spaghetti strap tank. Glitz juniors mesh top short sleeve top. The selection includes wholesale cheap tops and bottoms for women in a variety of styles for different seasons. For summer fashion, count on an inventory of sleeveless blouses and tanks that you can sell at attractive prices to draw the crowd in. 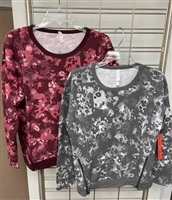 Our bargain bin also includes long-sleeve tops and light sweatshirts that are suitable for cooler weather. All-season fashion tops are part of this selection, so you can plan on stocking up for a promotional sale that can be scheduled whenever it is suitable. Our collection of cheap wholesale clothes for women online also includes lounge pants, fleece pants, active wear bottoms and thermal sets. With our special wholesale pricing, you can stock up various styles and watch your profits grow. Please do not hesitate to contact us with any questions concerning our selection of cheap clothing for women for retailers. We would love to help!